The show was created by writer Gerry Davis and scientist Kit Pedler, a well established partnership that had already spawned the Cybermen for Dr Who. But this time the pair's focus was far closer to home. During one of their regular creative sessions Pedler posed the seemingly simple question - what happens when technology fails? The ensuing discusion sparked off the idea for a television series about a team of government scientists responsible for watching over new research and investigating technology abuse. The pair felt that plots should be drawn from real events with the emphasis on scientific fact rather than science fiction. Both men started to keep scrapbooks of newspaper cuttings on possible Doomwatch subjects and within a very short time they had collected "literally thousands of examples", claimed Davis. Various titles were suggested for the show and for a while it was to have been called Earth Force. However, when the name Doomwatch suggested itself its sinister overtones seemed more in keeping with the programme Davis and Pedler had it mind and the name stuck. The choice proved to be a judicious one - the word gained an entry in the Oxford English Dictionary - Doomwatch: observation to prevent destruction of the environment. The show's format was registered with the BBC in July 1968 with the serious work of developing characters and plots underway before the end of the year. The series was put into studio just before Christmas 1969, with the first episode - The Plastic Eaters - screening the follow February. 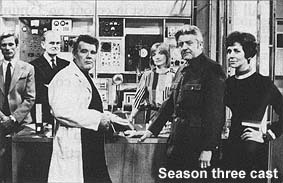 The Radio Times carried a Doomwatch cover to promote the show (as it did for seasons two and three) and a feature under the headline: The honeymoon of science is over - and married life is not so rosy. The article detailed events that had inspired some of the first season episodes along with interviews with the production team, which had been expanded to three with the appointment of Terence Dudley as produced - the role of script editor having been taken by Davis with Pedler acting as scientific advisor. Not everyone liked Doomwatch at first. Mary Malone, The Daily Mirror TV critic at the time, gave the opening episode the thumbs down. She considered it "unbelievable" but before the year was out her paper had taken a very different view. It set up its own Doomwatch team, including Pedler, to investigate issues on behalf of its readers under the headline: Call in Doomwatch! They are ready for action! The government considered going one step further, and for a while thought about setting up a real-life equivalent to the TV series. The Labour MP, Ray Fletcher, planned to create a Doomwatch committee at Westminster which was to have included Pedler among its members. It never came about but by that time the publicity Doomwatch had given environmental issues had started to pay off. Davis was quoted in the Daily Mail as saying: "It is a staggering coincidence that many of the programmes we put out turn into reality a few days later. Of course we do our research in scientific journals but that does not explain everything." This feeling of reality was compounded by constant references to the series by scientists and politicians. A college in Plymouth went even further and ran a course on the social responsibilities of science called 'The Doomwatch Diploma'. "Doomwatch is not science fiction," insisted Davis. "We go to great lengths to check our scientific facts. I think the programme is successful because of its elements of suspense, but also because it is real as well." The phenomenal reaction to the show guaranteed it two more seasons although these never managed the same prophetic levels as the first batch of episodes despite some inventive writing. However, the real strength of Doomwatch is that many of the issues it tackled are still relevant today.